Bentley Motors Ltd., of England, now a wholly-owned subsidiary of Germany's Volkswagen AG, has released a very limited run (250) of "luxury" laptop computers to compliment their bespoke automobiles. The aptly-named "Ego for Bentley" will be will be retailed globally in high-end stores from autumn 2008 for (are you sitting down?) $19,800. For that you'll get Microsoft's mediocre Vista operating system and a modestly-sized 160 GB hard drive. The real money is being spent on stuff like a white gold frame engraved with the limited edition number and handcrafted "Bentley leather" styled with Bentley cross-over hand stitching. 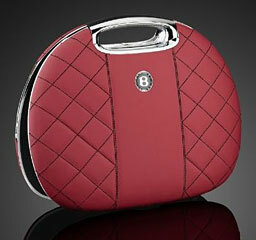 The computer was designed in partnership between Ego Lifestyle - a firm founded in 2003 by Huub van de Boogaard that designs, markets, produces, and distributes high-end luxury lifestyle consumer electronics - and Bentley's own styling team at the company's traditional headquarters in Crewe, UK, and is pitched as "completely breaking with traditional design and use of computers," moving "away from the traditional notebook and creat[ing] an exclusive fusion of unique fashionable design, ultimate functionality and an individual's personality." But fascinatingly, the computer somehow ended up looking as if its mother had been frightened by a clamshell iBook, of all things. It would seem bizarre to suggest that those august designers of two high-end firms copied the general shape and styling of a nine-year-old, mass-produced design that was, after all, a low-end consumer laptop even for Apple (that originally sold for $1,599) for their $19,800 machine, but the resemblance is more than striking. Mind you, the clamshell iBook of 1999 through 2001 was arguably the most unique and interesting laptop design Apple ever produced - and the only one with a built-in carry handle. The Ego laptop has a handle too - an ergonomic, integrated one designed to "remove the need for an unattractive bag or case." 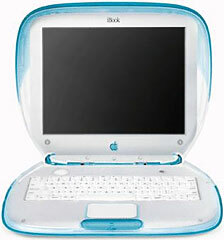 From some angles the shape of the computer body and lid, calling to mind an oversized cosmetics compact, characterizes both the Ego and the clamshell iBook design. 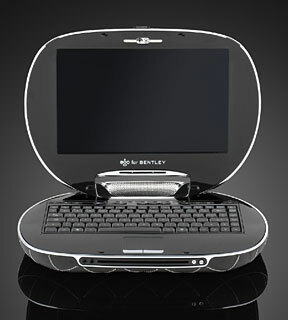 The clamshell iBook was available in several colors, while the Ego laptop comes in an even greater range of color options for the outer leather skin, and the lacquered inside can be finished to match Bentley's most popular exterior paint colors for ultimate color coordination. Sliding doors cover the Ego's I/O ports, while pure chrome detailing in the best automotive tradition is featured throughout. Of course, stratospherically-priced options are the dominant motif rather than the exception at Bentley, whose new Continental Flying Spur/Speed model, which sells for nearly $200,000 US, is a relative low-end bargain compared with the top-of-the-line 2009 Bentley Brooklands coupe, itself a limited production model (550 will be built, and they're sold out), which goes for a nosebleed-inducing "base price" of $348,085 - plus optional extras, of course. Reportedly the typical one is going out the door at a price in excess of $400,000. The Continental Flying Spur/Speed's optional 1500 watt 15-speaker Naim sound system is priced at $6,900 over whatever comes standard, but that's nothing compared with the Brooklands' optional carbon/ceramic brake rotor option (functionally not a bad idea for an extremely fast - 0 to 60 MPH in 5.0 seconds - fast land yacht that tops the scales at nearly three tons - 5980 lb.) will set you back $29,270. Of course, that's chump change for the average Bentley Brooklands buyer, who reportedly owns eight automobiles and has a net worth of $30 million. $19,800 for a laptop? Pocket change hardly worth mentioning.